When you're trying to get your five-a-day, popping open a can of peaches or pears can seem like a quick way to include more fruit in your diet. While it doesn't have the visual or textural appeal of fresh fruit, canned fruit can be a healthy option as long as you pay attention to what, exactly, is in the can. Canned fruits can be a good source of vitamins and minerals, but check the nutrition label to determine exactly what nutrients you're getting. Canning typically reduces the levels of most B vitamins and vitamin C, compared to fresh fruits. Minerals, fiber and vitamins A and E are found at roughly the same levels in canned fruit as they are in fresh fruit, although this can vary depending on the specific type of fruit. On the other hand, fresh fruits lose nutrients more quickly because of exposure to air, while canned fruits retain their nutrient composition over time, so a can of peaches may have more nutrients overall when compared to a sliced peach you've had in the refrigerator for a week. The liquid that surrounds the fruit may be just as important as the fruit itself. 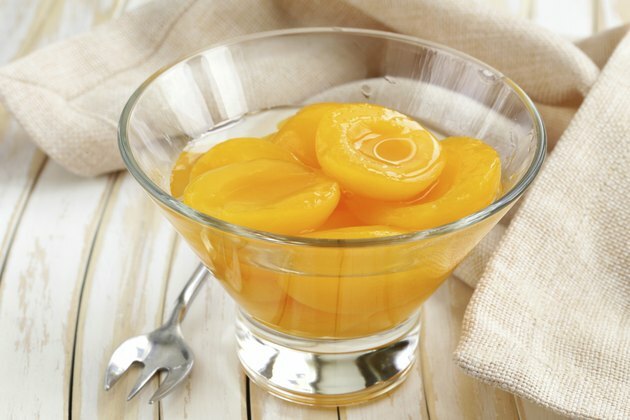 Canned fruit packed in heavy syrup has extra calories and sugar that can wreak havoc on your diet. If you're looking for healthy canned fruit, opt for varieties packed in their own juices or water. Because some of the vitamin C leaches out of the fruit over time and ends up in the liquid, you can retain some of the otherwise-lost nutrients by using the liquid, too. According to research published in 2011 by scientists at the FDA's Center for Food Safety and Applied Nutrition, about 90 percent of canned goods contain BPA, a chemical found in the resin that lines the cans. While research on the exact impact of BPA on human health is ongoing, people who wish to avoid BPA should choose canned fruit made by companies that don't use it in their packaging. If you're on a budget, canned fruit may cost less than the same amount of fresh fruit. If you can't afford fresh fruit or it isn't readily accessible in your area, it is preferable to boost fruit consumption by adding canned fruit instead of forgoing fruit altogether. Canned fruit may also be more convenient when it comes to creating impromptu desserts or last-minute breakfasts. Nutrition 411: Vegetable Debate: Fresh, Frozen or Canned? Do Fruits Lose Their Food Nutrients When Frozen? Does Fruit Lose Nutrients in Oxidation? Does Fruit Lose Its Nutritional Value When It's Blended?